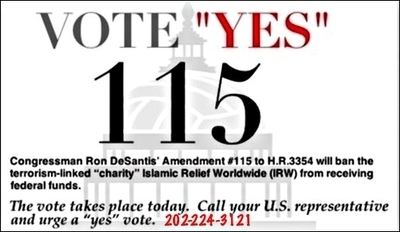 At some point in the next few hours, Congress will be voting on Congressman DeSantis's Amendment (115-31), which will ban Islamic Relief Worldwide (IRW) from receiving federal funds. IRW is an Islamist charity with links to Hamas and the Muslim Brotherhood. It has a long history of promoting extremist ideology across both America and Europe. IRW claims to have already received $704,662 of taxpayers' money. Please call your US Representative now. Ask him or her to support Rep. DeSantis's Amendment #115-31​ to the State & Foreign Operations Appropriations Act (H.R. 3354). Click here to find their contact details: www.house.gov/representatives. Alternatively, you can reach the Capitol switchboard here: (202) 224-3121. 1. Islamic Relief Worldwide (IRW) is one of the most important Islamist institutions in the world. Established in England in 1984, IRW now serves as the headquarters for the Islamic Relief franchise, managing dozens of branches across the world and hundreds of millions of dollars of revenue. For its entire history, IRW has been managed by Islamist operatives connected to extremist networks in Europe, America and the Middle East. 2. In 2014, the United Arab Emirates, a key ally of the United States, designated IRW as a terrorist organization because of its links to the Muslim Brotherhood and Hamas. This ban followed similar accusations leveled against the charity in Israel and Egypt. 3. In 2012, the Swiss banking giant UBS closed down Islamic Relief's accounts and "blocked donations coming from its customers to the charity." In 2016, it emerged that the international bank HSBC had also closed down Islamic Relief's accounts. Both interdictions were reportedly over terror financing fears. 4. IRW has financial ties with a number of groups accused of terror financing. In 2004, 2007, 2009, IRW accounts revealed donations of tens of thousands of pounds from the Charitable Society for Social Welfare, a charity founded by the Al Qaeda terrorist and "Bin Laden loyalist" Abdul Majeed Al-Zindani, whom the Treasury Department has named a Specially Designated Global Terrorist. IRW's other financial partners include the Arab Medical Union and the International Islamic Charitable Organization Kuwait, both of which finance Hamas. 5. In Gaza, Islamic Relief has funded the Al Falah Benevolent Society, which is described by the Meir Amit Intelligence and Terrorism Information Centre as one of "Hamas's charitable societies." It is runby Ramadan Tamboura, whom the newspaper Ha'aretz describes as a "well-known Hamas figure." Mohamed Ashmawey, who also served as President of the Muslim Arab Youth Association when it organized a conference in 1995 featuring the Hamas military leader, Sheikh Muhammad Siyam, who toldthe conference: "Finish off the Israelis. Kill them all. Exterminate them. No peace ever." Essam El Haddad, who has been since jailed in Egypt for his role in the short-lived Muslim Brotherhood regime. The prosecution found him guilty of passing "defense secrets" to "elements of the Iranian revolutionary guard," and collaborating with the terrorist groups, Hamas and Hezbollah, to "create a state of chaos" in order to seize power in Egypt. Issam Al-Bashir, an ally of wanted war criminal, President Omar Al Bashir (no relation). Issam Al-Bashir even served as a Minister in the Sudanese regime during its campaign of genocide in the Darfur region. 7. IRW founder Hany El Banna also established an umbrella organization for Islamist charities, named the Muslim Charities Forum (MCF). The MCF is controlled by key IRW officials. In 2015, the British government cancelled all government grants to the Muslim Charities Forum after finding that it "supports or is linked to individuals who fuel hatred, division and violence." 8. Abdel Sattar Al Melejji, a former senior member of the international Muslim Brotherhood's Shura Council [Advisory Council], claims: "Hany El Banna's organizations in particular are relief organizations well-known in Europe who do real aid work. ... But ultimately the management and the governing ideology is that of the Brotherhood." 9. IRW's Muslim Brotherhood links disqualify it from government support. In 2015, British Prime Minister David Cameron old Parliament: "Aspects of the Muslim Brotherhood's ideology and activities therefore run counter to British values of democracy, the rule of law, individual liberty, equality and the mutual respect and tolerance of different faiths and beliefs." 10. IRW regularly gives platforms to some of most extreme preachers from across Europe and the Middle East. In April 2017, The Times reported that Britain's Charity Commission – the government's regulator of non-profits – had opened an investigation into Islamic Relief's decision to organize a tour with Yasir Qadhi, an extremist preacher who told audiences that killing homosexuals was part of his religion.